Hi! I've been looking for the official drawing dimensions of the official Raspberry 7" display, but without any success. Does anyone have the official measures for this product? Not only the external ones, but a complete document with all the drawing dimensions. Am I the only one not finding the radius of the rounded corner of the lens ? vdesmedt wrote: Am I the only one not finding the radius of the rounded corner of the lens ? Hi, I made couple covers. It appears to be radius close to 7 mm, but I just eyeballed it. jakeh12 wrote: It appears to be radius close to 7 mm, but I just eyeballed it. am i the only one who is not getting the dimensions between the outer and the inner screw drills? src123 wrote: am i the only one who is not getting the dimensions between the outer and the inner screw drills? All the mounting hole dimensions are there, and can be referenced from the edge of the screen and/or the metal back pan. Like many drawings you have to do some math to obtain dimensions not specifically detailed on the drawing. The M3.0 holes for mounting the display are 14.95 down from the top of the back pan (21.58 - 6.63 = 14.95) and the mounting holes for the RPi board (M2.5) are 20.8 down from the top of the back pan. So there is a difference of 5.85. Or you could go the other way and work from the edge of the glass. The display mounting holes are 21.58 down from the edge of the glass, the RPi mounting holes are 20.8 + 6.63 = 27.43 from the edge of the glass, giving you the same 5.85 difference between the two. I loaded that stl while rebuilding the screen from the drawing and I noticed that it's bigger than the measurements given, as you can see from the overlap lines in the picture provided; has anyone confirmed that this build is accurate or if the drawing is not? I have no issues printing it and comparing it to the rpi 7" screen I currently have; but to save time while building I'd prefer not to have to redesign what I'm building in post. I measured 110.76mm on my screen which is what I'll use as a confirmation of my template and the official drawings accuracy. I just printed a screen template and the STL provided I believe is designed to deal with shrinkage following a print job, but since I print nearly everything with some variation of Taulman Nylon this will not work; the drawing provided in previous posts is the correct sizing for sure. If you use the drawing to build the screen or use it as a reference, the measurements provided should work perfectly. After I finish building my new console, I'll post the correct to scale screen as an STL so you can use it for future projects. 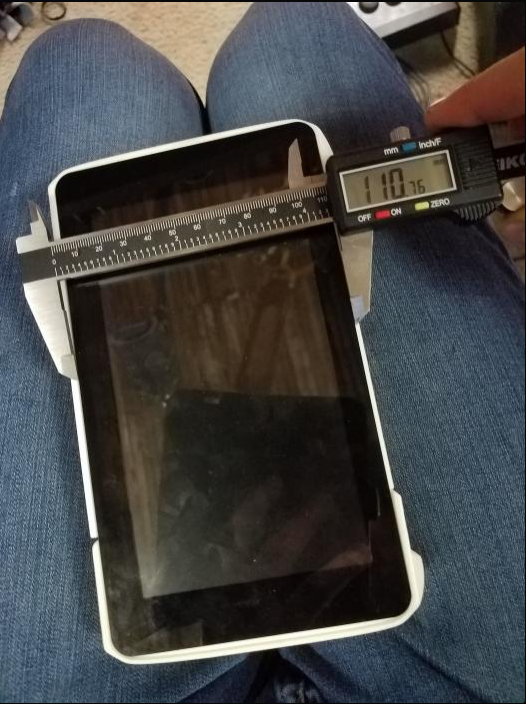 Re: Official drawing dimensions for the 7" touch screen display? I found an error in the dimensions provided in the doc posted at the beginning of this thread. The diagram for the back of the display seems to be flipped exactly 180 degrees. Given nobody else has mentioned this, I wonder if the design has changed? 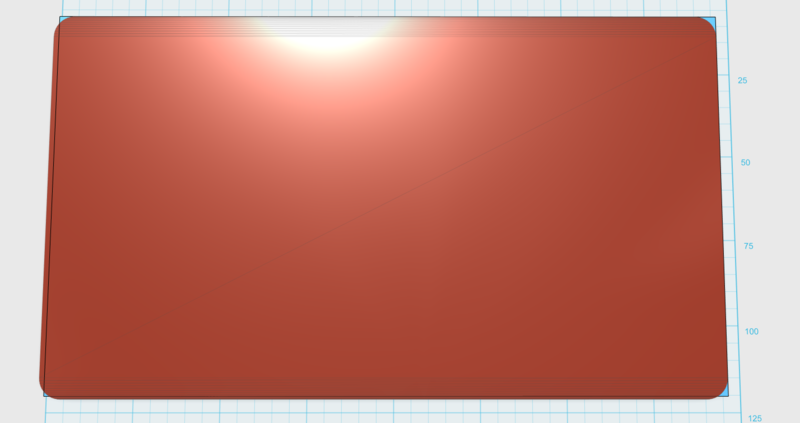 From numbers in the doc, I used Illustrator to draw the back of the screen; the outer rounded frame, the inner square LCD boundary, and the four screen mounting holes (I stopped there). The doc clearly shows the ribbon cable exiting the bottom of the drawing. The mounting holes seemed too low when compared to my physical screen however. So, I superimposed my Illustrator drawing over the photo of the back shown in the install guide (second step). This photo also clearly shows the ribbon cable exiting the bottom of the screen. When superimposed to align the drawing mounting holes with the photo's holes, the photo's LCD frame boundary does not align with my drawing's LCD boundary. When flipped 180 it matches exactly. Has anyone else noticed this? Or am I crazy? One other interesting note; the LCD screen's rectangular boundary is not centered within the outer frame, so orientation also makes a difference wrt alignment. However, it appears that this alignment is correct, and its just the mounting holes that are misaligned.